This bulletin provides monthly updates on upcoming events and activities by the Graduate School. We are offering the following RDP courses in February. 13 February 2019 2pm – 4pm What Do I Want to Get Out of a Conference? We are also offering the following PST courses in February. To register, please click on the course title. This will direct you to our Moodle page where you can log in using your University credentials. U21 (Universitas 21) in collaboration with PwC (PriceWaterhouse Copper) are challenging postgraduate students to a contemporary, globally-important work-related issue. The prize includes a 7-day trip to Dubai, exclusive world-class training and internship opportunity with PwC or one of their locally based clients. The awards recognise accomplishments in research, publications, conferences and contributions to the postgraduate community. Each award has a value of RM750. Nomination is done through Head of School (HOS) / Head of Department (HOD) and each school/department can only nominate one student. This year, postgraduate research students are able to self-nominate themselves to HOS/HOD for consideration. This survey is your chance to tell us about your experience as a postgraduate researcher at University of Nottingham. We want to know what works well and what we could do better. Check your inbox for the invitation email, click on the link, then tell us what you think. You could even win a cash prize of RM150! This competition is a great opportunity for postgraduate taught and research students to share their passions for their research projects, practice their presentation skills and engage with the wider audience. The call for participation will open soon and more details will be announced in due course. Stay tuned! This session aims to introduce the scope of the Graduate School to the postgraduate community at UNM, in terms of support and development opportunities. It will be a good opportunity for new postgraduate students to assimilate into the postgraduate community and hit the ground running, socially and academically. This session is scheduled of 22 February 2019 at 2pm to 3pm in H1B13. It is intended for new postgraduate students, but current postgraduate students are also welcome. This is a platform for postgraduate students to get together and mingle among themselves. It aims to connect postgraduate students with one another in a friendly environment. Postgraduate students may take this opportunity to temporarily get away from their work and catch up with fellow postgraduate students before returning to their routine with a refreshed mind. The first Coffee & Cake session of this year is scheduled for 22 February 2019 at 3pm to 4pm in H1B14. All postgraduate students are welcome! 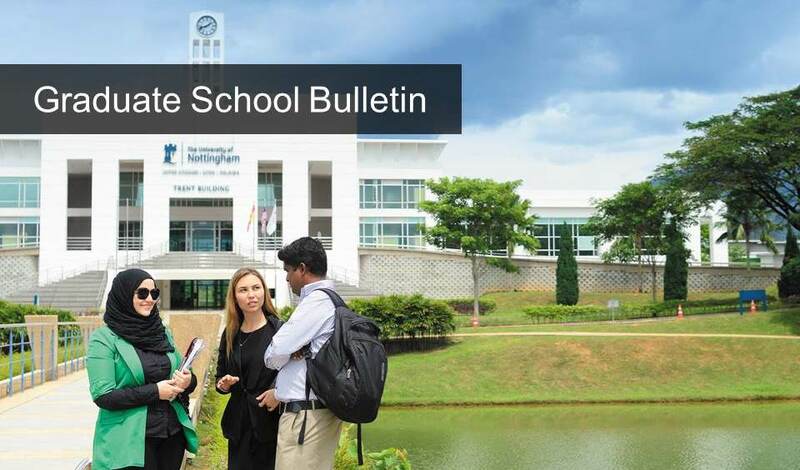 For any queries, please email us at graduateschool@nottingham.edu.my.